The Bob cake was baked in a round baseball/soccer ball pan and Larry came from a normal 13×9 cake pan. after it was baked I cut out the Larry shape with a sharp knife. I made the frosting a little thinner than usual so it would have a glossy finish. The eyes are made from giant marshmallows that I flattened out and shaped according to the signature veggie tale eye-shape. The inner part of the eyes are black jelly beans. Both noses are made from gumballs. Bob’s tomato stem was constructed from green sour straw candy that can be found at most grocery stores. Bob’s mouth is made from a white frosting writing pen that I bought at the grocery store. Larry’s mouth is actually a black piece of glossy construction paper that I cut out and stuck a white chicklet to with a dab of frosting for the glue. 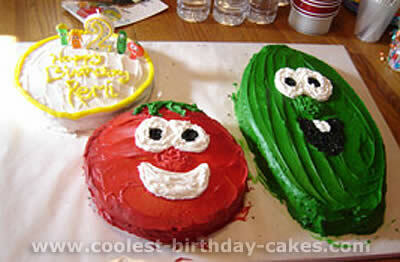 This Veggie Tale cake was for my daughter’s second Birthday party. 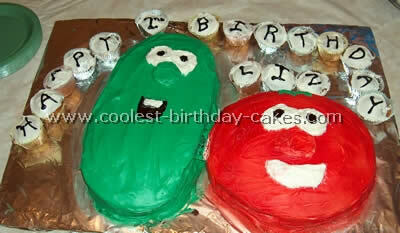 She loves Veggie Tales so I tried to think of a way to make a Bob and Larry Cake. I used two box cake mixes. Made one a 9×13 and one circle then used the left over mix for mini cupcakes. I made Larry out of the 9×13 by cutting out his shape and then used the circle cake for Bob. 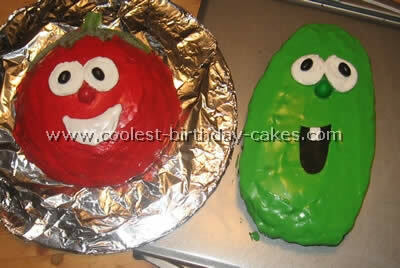 To decorate them I used icing with food coloring for Larry and then for Bob I used a red icing spray. I then used the leftover white icing for their eyes, nose and mouth and black decorating gel for the details. It really wasn’t too tough and everyone loved it. 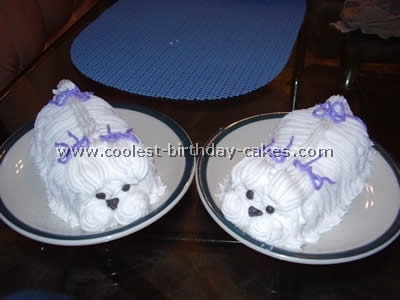 For Bob I used a soccer ball cake pan mold and for Larry just a basic sheet cake pan. I added green and red food coloring to store bought frosting for both. For Bob and Larry’s nose I molded small balls of leftover cake and used tooth picks to fasten to Bob’s face. For the French peas I used store bought sugar cookie dough and added green food coloring. I finished them off by using black decorating gel (in the baking aisle of any grocery store) to draw the faces. I also used a tube of black decorating icing for Bob and Larry’s eyes and mouth. 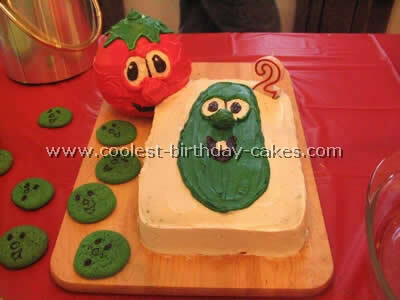 This cake was made for my daughter’s Veggie Tales themed party. It is actually three cakes. First Bob is just a single layer round cake iced red with eyes and mouth drawn on in icing. Larry and Junior are made from a single layer sheet cake. Simply cut out the shapes of each character and frost with green icing. Draw on eyes and mouths with frosting. From the extra cake cut out round noses for each character. Frost with red and green to match. For Junior’s hair – place mini marshmallows on his head and use green spay icing in a darker green than the cake is frosted. Enjoy! 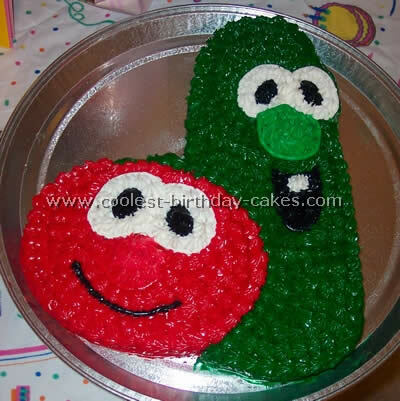 The pattern for this veggie tale cake was taken off of a box of Veggie Tale band-aids we had. I traced the picture and blew it up on a copy machine so that Larry was about the size of the biggest rectangular cake pan I had. I baked a large rectangular cake for Larry (vanilla flavor) and circular cake for Bob (chocolate flavor). I laid my pattern on top of the cakes to be able to cut the right shape. A semi-circle was removed from Larry in order to place Bob in the correct position. I used a large star-tip to decorate the cake. 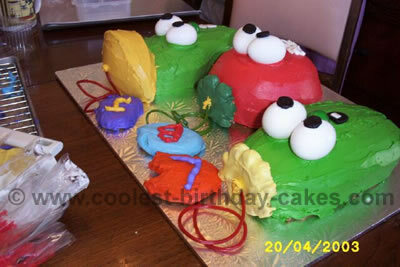 To be able to make out the noses you’ll need to make a batch of icing in a slightly lighter shade of red and green. 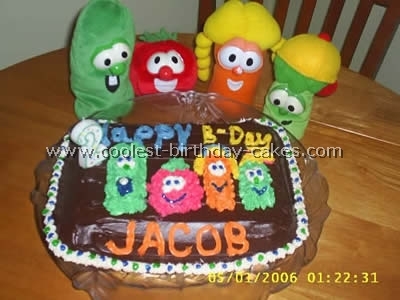 My son loved seeing his favorite veggies all decked out for his birthday. I made this cake for my son’s 2nd birthday. He is a HUGE Veggie Tale fan! The problem is he loves all the characters. I decided to make this cake to include all his favorite Veggie Tale characters and I got the general template from his Veggie Tale dolls. I made the sheet cake with Devils Food cake mix and covered it with fudge chocolate icing. I colored cream cheese icing yellow, green, orange, blue, and red. I decorated the cake and finally finished with gel icing for small details. It was great and he LOVED his cake! 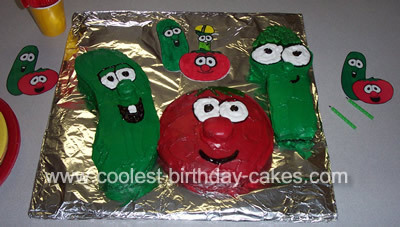 I got this idea from the Coolest Cakes website and originally from the fact that my 2-year-old is OBSESSED with Veggie Tales. I made Larry out of a 9×13 pan and Bob out of a 9-inch round. I used the other 9-inch round to write "Happy Birthday" and put the candles and a few character pictures on it. 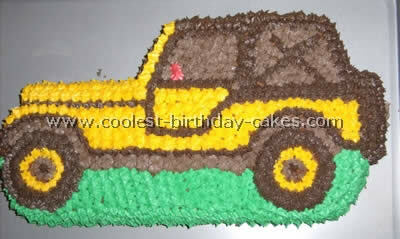 To color the frosting I used Wilton concentrated color paste – it’s much easier than regular food coloring. I used white icing to make the eyes and teeth and black sugar sprinkles for the pupils and Larry’s mouth., Everyone loved it – it allowed me to make both chocolate and white cake available to my guests and my son FREAKED OUT when he saw Bob & Larry! 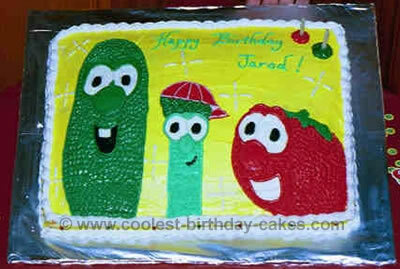 This Veggie Tale cake is, of course, based on the Christian cartoon series for pre-schoolers. My models for the cake were actual stuffed toy dolls that belonged to Christopher, the birthday boy. The cakes were baked in bread pans and a circular bowl. The veggie tops were created from cookies, dipped in melted chocolate, c/w string candy. The eyes are simply hard-boiled eggs, each with a slice of black licorice to represent the pupils.